Eh, it’s-a Tombasi, un Cocktail Originale! 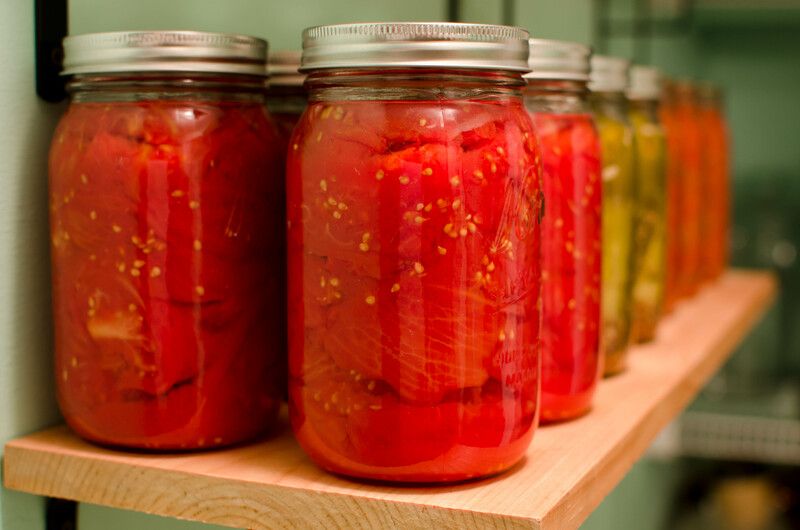 A couple of weeks ago, the Lauer household was inundated with tomatoes. The gardens were cranking ’em out in July, and we could only consume so many of them. Our stomachs replete with red fruit, we offered them up to neighbors and co-workers, and with their stomachs replete, we had to move on to long-term storage solutions…along with a few experiments. The Atlanta Journal-Constitution apparently felt the same pressing need to use up bushels of tomatoes, and so, alongside their coverage JCT’s Attack of the Killer Tomato Festival, they offered up two tomato cocktail recipes, one of which features a tomato syrup. Well, having made up a batch of syrup for Pura Vida’s Rio Rosa Swizzle (see the AJC article, above), I figured, Why waste the syrup on just one drink? 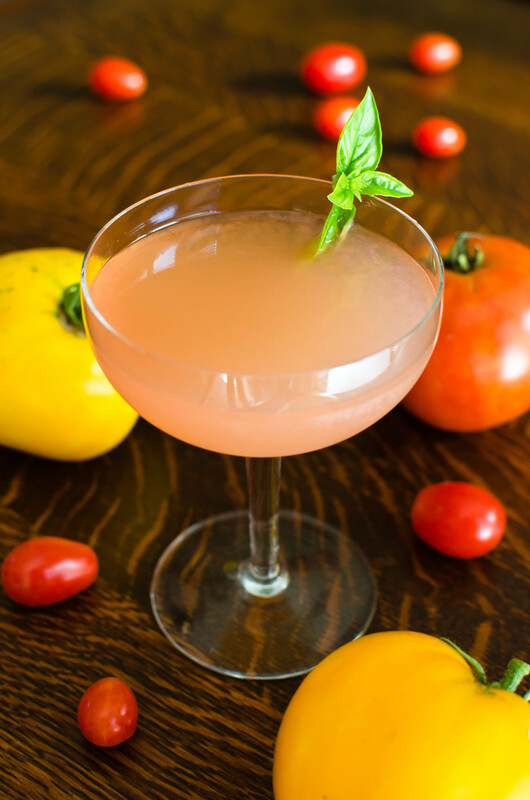 The Tombasi is my attempt — a successful one, I think — at a drink that captures our freshly-harvested tomatoes in all their glory. Gently muddle the basil with the liquid ingredients — lightly press the leaves, don’t annihilate them yet. Add ice and shake, then fine strain into a coupe. Float a small basil leaf on top of the drink. Liquefy the tomatoes in a blender, then strain through a chinoise or mesh strainer and set aside. Once the vinegar-sugar mixture is somewhat cool, add the lemon juice. Once completely cool, add the strained tomato puree. The drink is essentially a hyper-modified gin sour, or perhaps a coupe-sized, sweetened version of a Red Snapper, which is a Bloody Mary made with gin. The Tombasi takes the Worcestershire out of the Snapper and replaces it with the tomato syrup, which is sweet, slightly vinegary, and filled with the essence of tomato — it’s a rich, savory mixture. 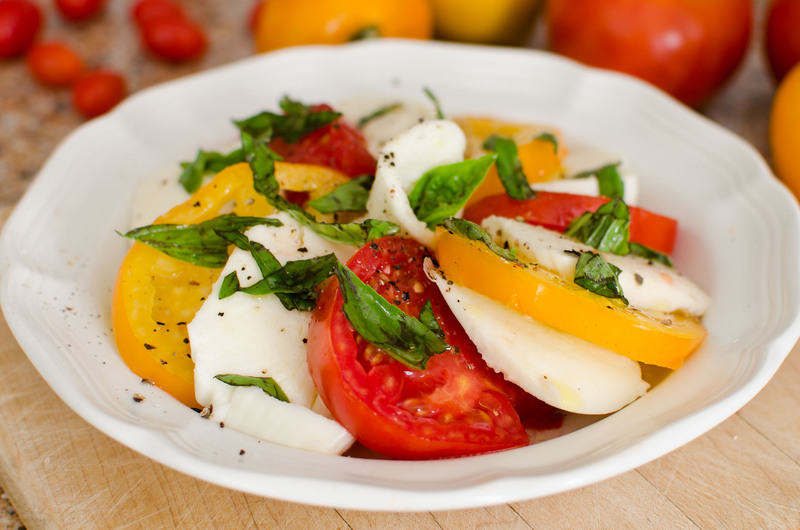 What sets the Tombasi apart from the Bloody Mary family is the use of basil: being in the mint family, fresh basil adds an herbal, cooling presence to the drink, and as everyone who’s had fresh insalata Caprese knows (see photo, below), tomato and basil are made for each other. Did I mention we have buku basil in the garden right now? I dashed in the orange and lemon bitters to restore a bit of zing and complexity to the drink, since the tomato is a heavyweight ingredient that has a tendency to dominate and the lemon juice adds acidity but no bright, citrusy oils. While a lemon twist yields interesting results, I find it adds too much of that lemony goodness and competes with the tomato and basil. What I’m very happy with is the felicitous agreement between the Tombasi and Catoctin Creek Watershed Gin. You see, it’s a bit of a tricky gin to mix with as it has a very distinctive taste that includes the flavor of the of the rye grain used in its production. Although I’ve tried it in a number of gin drinks (see the Ding Ho), Catoctin doesn’t always result in an exceptional cocktail, and is best used in simple drinks such as the Tom Collins or Gin Sour. In the Tombasi, however, the Catoctin is wonderful: perhaps its grain-heavy flavor mingles with the tomato and basil to produce a cocktail that tastes a bit like a pasta — I don’t know, it just works. Another trick with Catoctin Creek gin is getting a hold of some — if you live in Virginia or Maryland, piece of cake (I had to order mine through a D.C. liquor store, but try Weygandt Wines, as well). Should you like to substitute something that’s easier to find, I suggest Beefeater 24 (which supposedly has notes of green tea and grapefruit) or a gin that goes a little lighter on the juniper and pine — not classic London dry, but not something as herbal as 13th Colony Southern Gin. I have a hunch that Plymouth and Aviation will work, but I have yet to try them in the Tombasi. If you’re looking for other uses for the tomato syrup, here’s a good one: we whipped up some marinara sauce with all the extra tomatoes we had lying around and drizzled a little bit of the syrup into the sauce, improving it remarkably. Apparently the addition is an old trick, as the tomato syrup in question is really a kind of modified gastrique — a sugar and vinegar reduction frequently used to improve sauces. The syrup also bears some resemblance to the humble “shrub” (fruit syrup combined with vinegar), which is finding its way into cocktails across the country this year. So, enjoy those tomatoes while they last, because they won’t be around in the winter. Well, unless you do some canning, that is. This entry was posted on August 18, 2012 by IJ Lauer in Bittercube Bitters, Drink Recipe, Gin, Ingredient Recipe, Lemon Bitters, Lemon Juice, Orange Bitters, Original Drinks, Rich Simple Syrup and tagged basil, cocktail, drink, fresh, gin, lemon, lemon bitters, orange bitters, recipe, rich syrup, tomato, tomato syrup, tombasi, vinegar.